"Mediocre tourney brawling with poorly localized anime pirates"
There, I said it. I like the flow of the anime, the uniquely likeable and relatable characters. I love that each arc is special and deals with issues such as friendship, obligation, desire and hope as well as the darker emotions such as jealousy, greed, hate and anger. I like the original voice cast, from the main cast who are never far from the spotlight to the most fleeting one-liner background characters, each so completely invested in the person they try to bring to life. You will find very little of those attributes in this game. One Piece: Grand Adventure is a game developed by Bandai, and, like most Bandai games, it promises one thing when you first start it, and that is a lot of flair. If you are a fan of the anime, you will smile with glee when you see the character roster branching from the favorite Straw-Hat Pirates all the way to various villains that Luffy and company meet during their journey through the Grand Line – the most dangerous sea on the planet. All these characters are searching for One Piece, a treasure that would mark the crew who finds it as the most powerful band of people in the world and crown their captain the Pirate King. You do this, of course, by beating the crap out of your opponents in arenas. Every character has strengths and weaknesses, which will require strategy on your part if you want to defeat the opponent. For instance, characters like Zoro (or, thanks to one of many head-scratching localising choices, Zolo) is a power character, and he can hack and slash through people with his swords without paying too much consideration to the surroundings and items scattered around the arena that he might use. In contrast, Usopp is a fairly frail guy whose attacks do miniscule damage when compared to Zoro's. However, because he can utilize his strengths best by using various items, if you find a weapon on the stage that deals damage – a bomb or baseball bat, perhaps – you will see that Usopp can employ them to much greater effect. Also, each character has a unique support character, a sort of summon which will call one more person to aid you against your opponent in various ways. Characters like Nami who have a pretty high support ranking could get much use of said techniques since their summons will be much more efficient than the characters with low support rankings. The game is divided into categories. You might want to choose a random battle against a friend or a CPU controlled opponent, fight a tournament to see who is the strongest, or perhaps fight in a story mode, which guides certain crews through islands. By playing story mode, you can unlock most of the things that you will need for full enjoyment of the game, including new characters, equipment and alternate costumes, adding considerably to already generous customisation options. You do this with an RPG twinge; characters you use for battles in story mode will gain experience and gain new levels with extended use. As RPG gotta RPG, this allows you to add points towards various attributes stats. 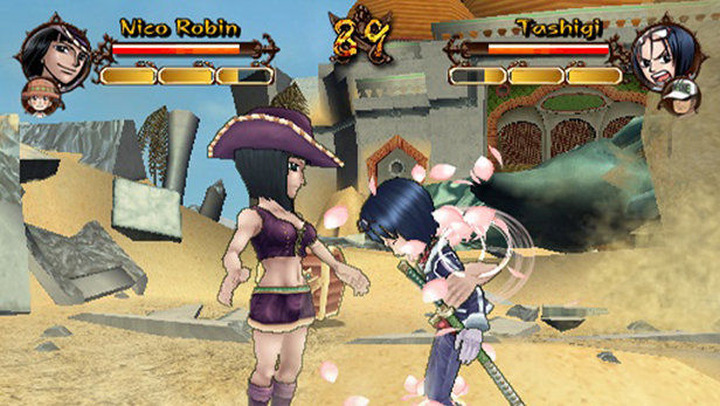 You could continue on the way that the game imagined it, continuing to build Chopper's defense as a tank or a Sanji's kick-based attacks. However, you could also go a different route. Perhaps you want Usopp to be the real manly-man of the sea whom depends on his strength alone. No problem! Add points to strength, special attack and defense, and there you have it: Usopp can manhandle Zoro anytime! All of this might sound pretty interesting, and, for a limited amount of time, it really is. However, the interest wanes very quickly. Not all of that is One Piece: Grand Adventure’s fault. As a product of its environment, it’s a game that only saw a Western release and was therefore based entirely on the openly derided and cripplingly incomplete American dub. This legendarily bad dub cut entire story arcs away for no obtainable reason, meaning that several characters, locations and plot points that fans following the original release would expect to find within the game are absent. Secondly, though the storyline is pretty faithful to the talking points of the anime/manga, it fails to conveys any of the substance or depth. This often makes it, frankly, a chore to finish because there is little to no explanation why you fight the series of fights you’re tasked with. It’s far too dependent on assumed prior knowledge and makes no effort to cater for people who have not already sunk countless hours into One Piece media. Worthy of mention are the localised character voices. Not for their praiseworthiness, but rather for their trashiness. Awful hamfisted accents make every character some sort of a stereotype conjured completely from the way they look. For example, let's take Nico Robin, one of the smartest people in the OP world, a renowned archeologist who once wore a hat. Because of said hat, the producers concluded that she must sound like a Texan cowgirl. Brilliant!. While I’m pretentious enough to always favour original Japanese voice actors, that doesn't mean there aren’t any good Western ones. Unless you use U.S One Piece as a case study. They are awful. Plain and simple. However, the greatest flaw of the game is, that no matter where you fall in the fanboy spectrum, the game will start to bore you fairly quickly. Even if it tries to add some variety by allowing you to play as rival pirate crews, the story mode quickly starts to feel like a chore. It delights in a conveyor of constant drudgery, showcasing the same monotonic fights only broken by cosmetic special conditions from time to time (only using normal attacks, the need to survive for a set amount of time, the need to finish with a support attack...). The fact is that when you get good enough, it won't matter what stat points you allocate towards your character build since you will be able to defeat everyone with even the weakest character in physical confrontation by just pressing and mashing buttons together. 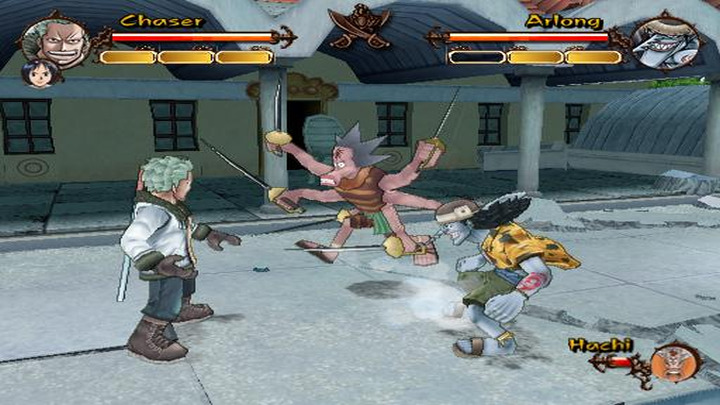 All in all, One Piece: Grand Adventure is not a bad game, but it is not a great one, either. You can have fun with friends where strategy will actually matter, but in a solo game you will get bored of it fairly quickly. Fans of the show will find more to appreciate; everyone else is better probably served finding their brawling fix elsewhere. If you enjoyed this One Piece: Grand Adventure review, you're encouraged to discuss it with the author and with other members of the site's community. If you don't already have an HonestGamers account, you can sign up for one in a snap. Thank you for reading! I've always been following One Piece even up to this day. PS2's Grand Adventure has some very good features. Hats off to the developer for making a game out of one of my favorite animes. None of the material contained within this site may be reproduced in any conceivable fashion without permission from the author(s) of said material. This site is not sponsored or endorsed by Nintendo, Sega, Sony, Microsoft, or any other such party. One Piece: Grand Adventure is a registered trademark of its copyright holder. This site makes no claim to One Piece: Grand Adventure, its characters, screenshots, artwork, music, or any intellectual property contained within. Opinions expressed on this site do not necessarily represent the opinion of site staff or sponsors. Staff and freelance reviews are typically written based on time spent with a retail review copy or review key for the game that is provided by its publisher.